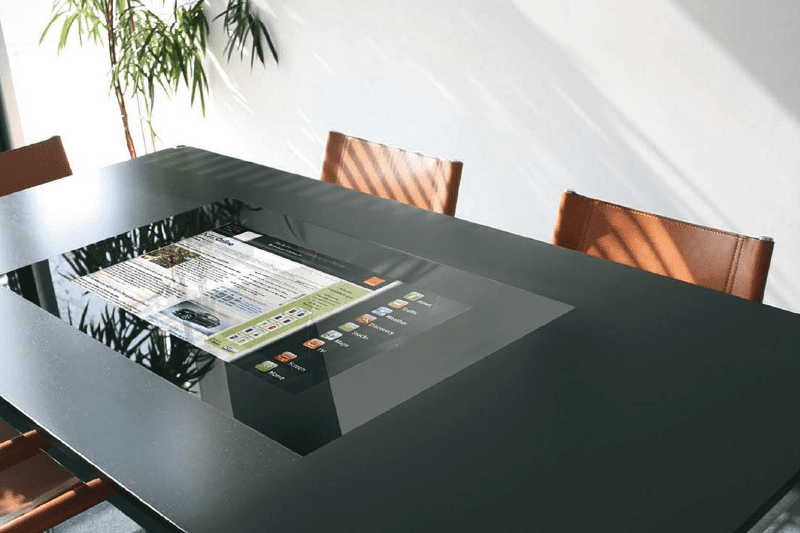 Already since 2008, friendlyway has been developing and manufacturing multimedial consulting tables with seamlessly integrated screens and touchscreen elements which are laminated transparently and virtually invisibly between the display and a robust armored glass pane. Meanwhile also known as „surface computer“. As a result of the friendly „technology injection“ introduced by friendlyway into a conventional table furniture, a meeting or consulting table suddenly presents itself as a fascinating interactive presentation medium. For example, as an interactive car configurator or kitchen designer, the consultant and the entire family have all the design options in mind. It is particularly pleasing to see that there are no more disruptive screens between customers and consultants, but all the attendees have an unobstructed view of the presentation of the desired object. The multitouch technology installed in the friendlyway imagine can be used, if desired, by all conference participants – even in parallel. Screens can be rotated, zoomed or swapped. Image text or video sequences can be operated separately. A fascinating experience of looking at, illuminating and explaining complex products from all angles and corners. Key customers are found in all consulting-intensive business segments, such as the financial industry. The „imagine“ surface tables by friendlyway have also been invaluable in all areas of business, where, of course, a great deal of visual presentation is required, In architecture, in the automotive sector, in the furniture sector, and also in museums. The friendlyway imagine consulting table has been developed in cooperation with the leading furniture manufacturer USM. The timeless elegant furniture from USM fits perfectly with the innovative consulting table concept of friendlyway. The timeless elegance of the USM furniture and the interactive integration of the friendlyway surface elements create a completely new consulting experience with which you can impress your customers for many years. Our customers are therefore opting for imagine consultancy tables, because they often present their own company and their unique products, and do not want to do so under any circumstances on an inferior „me too“ cheap solution. The huge 55 „display is equipped with the latest Multitouch technology and allows the perfect representation of even the smallest detail in absolute precision. Friendlyway imagine, the combination of two leading premium brands are real eye-catchers in your shop, in your foyer or at your trade fairs, if you want to impress your top target customers. The unmistakable shape and the appealing premium design invite your customers in a friendly way to get information about the know-how, about your company, your products and services at the imagine consulting tables. Of course the friendlyway imagine comes with the necessary software, which allows you to turn existing content (pictures, videos, Powerpoint, PDFs, Excel sheets etc.) into a fascinating presentation portfolio. If you want to present events professionally, you can also rent the imagine- ing equipment at friendlyway – and then only pay for the required day of use and logistics: we deliver, build up, start your application … and pick up everything after the event. A well-liked „around“ rental service of the friendlyway. Thus, the friendlyway imagine series is a system portfolio which is exactly tailored to your needs, which meets all modern requirements and completes every ambience through design and elegance. Make boring consultations an unforgettable experience. Whether it’s finance, the car or the real estate industry, the most spectacular way to present the diversity of your product options is here. Go to the wish car, or the new dream kitchen! „Everything at your fingertips – just in front of your eyes“.